ZA-KOENJI Public Theatre is a theatre for contemporary performing arts. 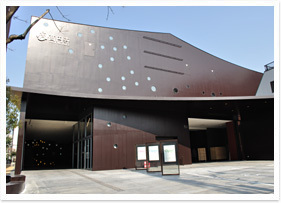 The theatre is funded by the city of Suginami in Tokyo and managed by Creative Theatre Network (CTN), a non-profit organization. The theatre produces, presents and supports a wide range of cultural activities for the community of Suginami, enabling people of all ages to see and take part in many art forms from drama and dance to music and storytelling. Director and playwright Makoto Sato, is the Artistic Director. His vision is for ZA-KOENJI to become a forum or Agora; a meeting point where the communities of Suginami can come together with local, national and international artists. To create new theatre and to revive important past productions by Japanese and international companies. To present a high quality artistic programme for children of cross generational appeal, designed to be understood and enjoyed by both children and adults. This programme shall include: a. New theatre productions offering children opportunities to develop their appreciation of the performing arts. b. Workshops offering children practical experience of making theatre. c. Picture book readings and activities for children at the cafe Henri Fabre. To present plays recommended by the Japanese Playwrights Association (JPA). A special collaboration with JPA has made it possible for the ZA-KOENJI to collect and archive plays and other materials relating to contemporary Japanese drama. The archive shall be open to the public, offering a valuable cultural resource to the local community. To open a theatre academy in collaboration with selected universities and other Japanese public theatres. The purpose of this academy is to offer specialised theatre training and to promote and develop young talent. This expertise will benefit community arts events as well as enabling young theatre practitioners to develop their skills to professional level. To become a cultural hub owned by the community, and using performing arts and festivals as a tool to regenerate and invigorate the city. Among many local arts events and activities, Za-Koenji will support THE BIG 4 festivals in Koenji, "Koenji Bikkuri Daidogei""Tokyo Koenji Awa-Odori""Koenji Fes" and "Koenji Engei Festival". To offer two theatres spaces, ZA-KOENJI 2 (civic hall) and AWAODORI HALL, for hire by local community and professional groups and companies. Groups may hire either space for up to 3 days. Applications can be made through the internet service, "Sazanka Netto". To increase attendances at the theatre through the "Namichike" ticket scheme, offering a book of 4 vouchers at a reduced price which can be exchanged for tickets to any Za-Koenji performances throughout the season. ZA-KOENJI 1, Main Auditorium An exciting flexible flat space, allowing a range of different stage and seating configurations with a capacity of 238. ZA-KOENJI 2, Civic Hall A 189 - 298 seater conventional theatre space with fixed raked seating, and suitable for drama performances, dance, concerts, conferences or lectures. AWAODORI HALL, Studio Theatre A space mainly dedicated to “Tokyo Koenji Awa-Odori” but which may have additional use as a rehearsal or workshop space, and for hire to amateur companies. Archive The ZA-KOENJI archive holds published plays, scripts and other materials relating to contemporary Japanese theatre. Cafe Henri Fabre A welcoming and comfortable cafe which can also be used as a venue for drama readings, lectures and children’s activities. A non-profit organization, CTN is funded by Suginami City to promote and develop cultural activity in the city, create professional development opportunities for staff, artists and local people, and to devise and manage a programme of theatre in education. Playwrights in Suginami city founded CTN in July 2005 in collaboration with independent arts consultants and a group of producers, directors, actors, technicians and managers selected from other leading public theatres and cultural centres. The acting president is Ren Saito, a playwright. CTN is designated to manage ZA-KOENJI Public Theatre by the city of Suginami and has appointed a team of theatre specialists to manage the theatre. The first of its kind in Japan, this cultural organization will play a vital role at the heart of the community and has already been recognized as a national model, inspiring other cities across Japan. Sato was born in Tokyo in 1943. In 1966, he founded the Free Stage Company and opened “Underground Free Stage” a venue in Roppongi, Tokyo. His most important work was centred on the activities of the theatre company known as the “Black Tent.” The company’s first production in 1970 was The Dance of Angels with Flaming Wings, an adaptation of Peter Weiss’ Marat/Sade. In the 1980s, Sato and his colleagues developed a new concept of “Asian Theatre” centred on a critical re-evaluation of Japanese society. He collaborated with several South Asian companies and more recently has collaborated with European theatre companies. Sato has attracted media attention as a director of opera, dance, revue, drama, and the marionette theatre company, Youkiza. From 1997 to 2002, he was the first artistic director of Setagaya Public Theatre. He is at present the director of Kamome-Za and of the Suginami Culture Association. Toyo Ito graduated from the University of Tokyo in 1965. His main works include Sendai Mediatheque, Matsumoto Performing Arts Centre, TOD’S Omotesando Building, Tama Art University Library (Hachioji campus), and Hospital Cagnacq-Jay in France, among others. He has received the Architectural Institute of Japan Prize, the Japan Art Academy Prize, the Golden Lion for Lifetime Achievement from the 8th International Architecture Exhibition at the Venice Biennale, the RIBA Royal Gold Medal and the 6th Austrian Frederick Kiesler Prize for Architecture and the Arts. Za-Koenji is committed to working with local, national and international partners to fulfill its creative potential, developing innovative, exciting and original theatre projects for Suginami and Tokyo audiences. The city of Suginami has also entered into two major partnerships to develop its cultural policy through Za-Koenji. The two partners of the city are the Japan Playwrights Association and Tokyo Koenji Awa-Odori Promotion Association (NPO). Through partnership working, the city and Za-Koenji aim to increase support for and participation in the arts in Suginami city and to increase access to drama, dance and music across the community. To protect the artistic and moral rights and interests of playwrights and to promote and increase access to Japanese drama. To promote opportunities for exchange between playwrights and enable them to share information and experience. To contribute to the development of the performing arts in Japan through exchange with international playwrights and theatre professionals. The Association also publishes journals, promotes contemporary Japanese dramatists overseas, has an annual award for new writing and organizes events to promote new work. All these activities are run by the playwrights themselves. With the cooperation of Japan Playwrights Association, ZA-KOENJI Public Theatre plans a wide range of cultural activity to develop and increase access to the performing arts. Tokyo Koenji Awa-Odori is a cultural heritage of Koenji City. ZA-KOENJI Public Theatre contributes to Tokyo Koenji Awa-Odori by allowing public access to the Awa-Odori Hall throughout the year. It plays an important role in preserving that tradition as it supports its activities in giving the possibility to practice the dance together with musicians. Copyright © 2008 ZA-KOENJI. All Rights Reserved.